Kang tables were typically used atop a platform, kang, or a couch-bed or daybed. For a discussion on kang tables, see S. Handler, Austere Luminosity of Chinese Classical Furniture, Berkeley, 2001, pp. 169-171. See, also, Wang Shixiang, Connoisseurship of Chinese Furniture: Ming and Early Qing Dynasties, vol. I, Hong Kong, 1990, pp. 48-52 for a discussion of different forms of kang tables. 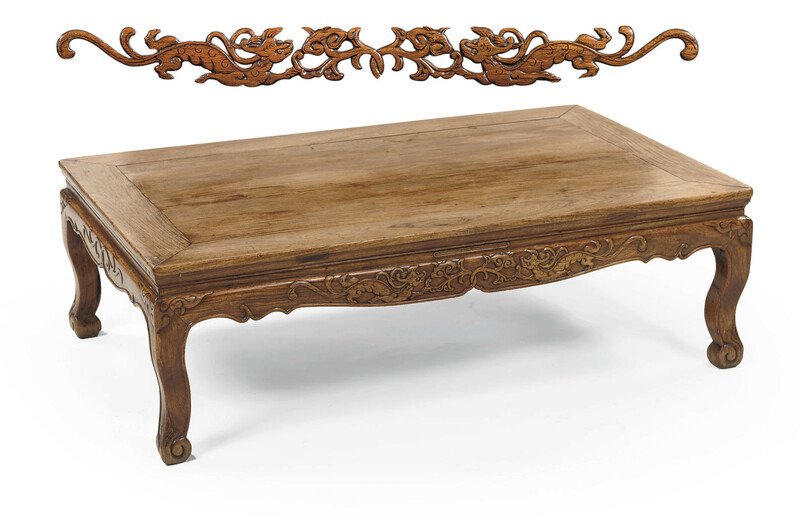 Dragons such as in this table rarely appear as a motif on the aprons of kang tables. Far more common among published examples are those with scrolling vines or undecorated aprons.